Putting the cluster of fins closer together loosens up the board while positioning them further apart makes the board stiffer. TIP: Move your fins only 1/8" (3mm) at a time because a little bit of movement makes a big difference. TIP: Move the center fin forwards for smaller, faster conditions and then back for down the line surfing. 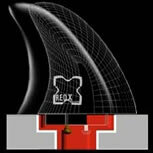 The Red X fin system is simpler, lighter, faster and stronger than any other fin system. The simple screw in system uses stainless steel fittings that never wear out. This pulls the fins tightly into the surfboard with a security you just can't find using other systems. No specialised gear is needed - nothing but a single blade screwdriver.